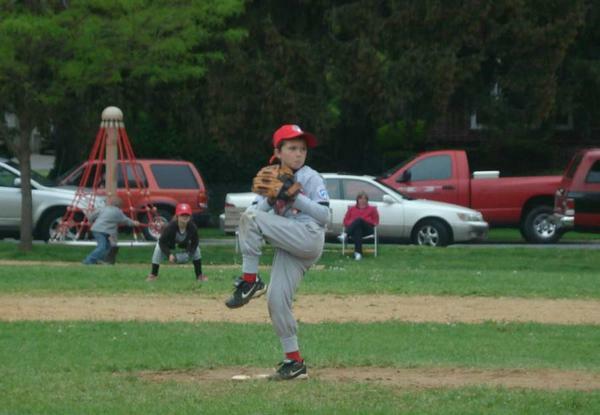 With baseball season kicking into full gear, it is important to ensure that young arms are ready for the field. While a great deal of emphasis is placed on "throwing more to get a stronger arm" there are several other factors to consider. The following is a simple list of assessment tools and exercises to address muscle weakness that increases the risk of injury to a pitching shoulder. Rotator Cuff Strength - Resistance band training with the elbow at the side is the most basic strength assessment/conditioning for the rotator cuff. Instructions: using a light resistant band, have the athlete place his throwing shoulder/elbow at his side. Grasp the band and rotate the arm away from the body. Be sure the elbow does not leave the side. Slow control movement, one repetition shoulder take about 4 seconds (1 rotating out and 3 seconds to return position. Do 10 repetitions ; 2 sets. Back / Scapular Strength - The scapular and back musculature are the most important muscles to protect the rotator cuff. Ensuring that these muscle groups are adequately prepared for a season of baseball is critical to long term success. Instructions: Laying flat on the stomach, let the throwing arm hang off the side of a bed or other hard/flat surface (able to clear arm from touching the ground.) With elbow straight and thumb point to the ceiling, lift straight up in front of body (1 second up; 3 seconds down). Repeat 10 times, 2 sets. Complete same exercise with arm reaching out to the side of the body (elbow straight, thumb up). Hips/Lower Back - Roughly 70% of ball velocity comes from the torso and legs. Ensuring adequate hip and low back strength is necessary for a long season, where shoulders wear out and strong legs/back carry through. Inability for any throwing athlete to perform these exercises suggests weakness that will increase risk of injury and decrease overall performance. Weak rotator cuff muscles will slow arm velocity down as the brain "pulls the brakes" for fear of hurting the shoulder. Poorly developed back and scapular muscles position the shoulder blade improperly putting the rotator cuff at risk of injury. Weak hip and lower back musculature decreases core stability and leads to poor throwing mechanics, increasing strain on shoulder to produce constant velocity. Developing a balanced and strong throwing athlete is critical to maximizing performance and reducing overall risk of injury. Keith J. Cronin is a physical therapist in the St. Louis, Missouri area. With baseball season kicking into full gear, it is important to ensure that young arms are ready for the field. While a great deal of emphasis is placed on "throwing more to get a stronger arm" there are several other factors to consider. Physical therapist Keith Cronin provides a simple list of assessment tools and exercises to assess strength deficits in a throwing shoulder that increase that increase the risk of injury and decrease overall performance.